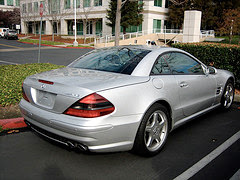 As many of you know, I’ve been partial to Mercedes uber-coupes. (See photos.) But I’m getting itchy for something new. I like the new CL. And the CLS is interesting too and almost expensive enough. The SLR could be fun. But I’m willing to look at other brands. Any thoughts? Suggestions? Money is not an issue, obviously, but taste is. So is performance. So please, no letters about the Prius, okay? » Why do people keep telling us what products they’d like us to make?